Gwilym Davies recorded William (Billy) Buckingham singing The Waysailing Bowl, Come In The Parlour Charlie, My Father’s Name Was Adam and A Group Of Young Soldiers in February 1979 at the Royal Arms in Stonehouse and later on 13 February 1999 Gwilym and Carol Davies videoed him singing this song and talking about the custom. Billy Buckingham was born circa 1902 and at age 8 moved to Kingscourt, near Stroud. He had two sons and a daughter. As a boy, he learnt the local version of the “Waysailing Bowl” and he and his companions, including his uncle, Albert, would travel around the local farms and big houses singing the song and collecting money. On a good night, they would make £3 each. In the 1970s, Billy would entertain regulars in the Spa Hotel and the now defunct Royal Arms in Stonehouse, with his version of the wassail song along with other songs such as ‘Little Ball of Twine” and “As I came home”. 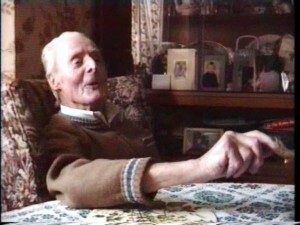 William James Buckingham died in June 2003 aged 91. Notes by Carol and Gwilym Davies, November 2011.